New 10 Wilby Crescent developer to try again. A few years ago, there was a proposal to build a 10-storey, 131 unit apartment building called ‘The Riverstone‘ on 10 Wilby, just at Hickory Tree Road – it claimed with some justification to be inspired by Frank Lloyd Wright’s Falling Water house. Readers may remember that the vehicle registration office was on the site some years ago. The proposal generated lots of interest but not enough to get off the ground. The site at 10 Wilby Crescent. To the left are the existing condos at 1 and 3 Hickory Tree Road. Adapted from Google Maps. In their unsuccessful bid, the non-profit developer Neighbourhood Concepts asked and received permission for two extra floors over the permitted 8. Part of the problem was that the adjacent Hickory Tree Road condos were selling for considerably less at the time. Sadly, Owner and CEO of Neighbourhood Concepts, Nancy Hawley died in 2015 and the site is now owned by another non-profit developer Options For Homes. They are requesting permission to build a high rise building double the permitted height to 16 storeys and increase the number of apartments to 234. By way of comparison, the condos (see above photo) at 1 and 3 Hickory Tree Road are 19 stories and the two buildings have a total of 413 apartments. Due to the anomalous lot shapes and slope profiles, any rezoning and site-plan applications in the Wilby Crescent area will specifically address appropriate siting and built form considerations in a manner compatible with the unique topographic features in the area. …significant concerns with respect to height, massing, configuration of the building at grade, the lack of landscaping, the relationship between the base of the building and the public realm, shadow impacts, the size of the floor plate for floors 11-16 and the lack of differentiation in the materials between the podium and tower components of the proposed building. Options For Homes apparently engineered a small land swap to make the site more regular. Adding extra height to a building makes each unit more affordable. If you can add more floors to a building, the cost of the foundations, elevators etc. is spread a lot thinner. The latest proposal is called The Humber. Bottom line: it’s probably a done deal – especially since the Weston Southern Weston Road Corridor neighbourhood is already zoned for apartment buildings. The problem once again will be finding buyers but this time, the UP Express is operating and is a short walk away, allowing a commute to Union Station in 14 minutes or Pearson’s Terminal One in 12 minutes. Adding to the attractiveness for first time buyers, the units will be sold at cost with an option to have the difference from market value used as a deposit. Any appreciation will be shared between the homeowner and developer once the homeowners sell, along with the return of the deposit. To keep prices even lower, there will be no community amenities such as a pool or sauna. The proposed building will be discussed at the next Etobicoke York Community Council meeting on January 17. The City’s Planning Department is recommending a community consultation. Height of building 55 metres or 180 feet. Apartment Types: 14 Batchelor apts. 33 One-bedroom apts. 69 One bedroom plus den apts. 56 Two bedroom apts. 62 Two bedroom plus den apts. I wonder what Wilby Cres. and Hickory Tree Rd. actually refer to in that part of Weston. Apple maps has Hickory Tree running right into Weston Rd., leaving Wilby as that short (behind the buildings) offshoot running south. Google also labels that offshoot Wilby but has Hickory Tree running into it (and ending) at that juncture. If 10 Wilby is the old vehicle registration site, then Hickory Tree doesn’t even go that far. 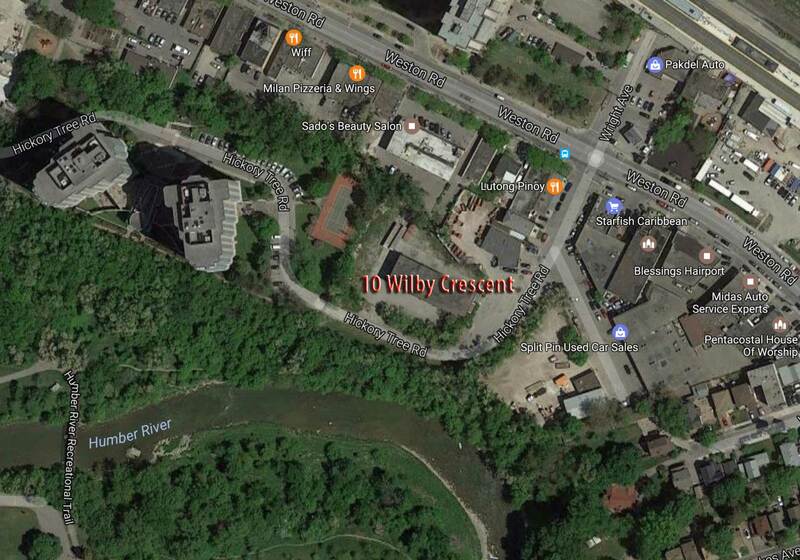 Instead, the offshoot doesn’t have a street name and Wilby runs straight and then (perhaps) curves north. There is no public access to Hickory Tree at Bellevue Cres. Or for that matter from Wilby: there is a fence across the road! It puzzled me too but there’s definitely a 10 on the existing one-storey building and Wilby intersects with Weston Road so the property at #10 while mainly on Hickory Tree must occupy an inch or so on Wilby. Hickory Tree ends and becomes private property at the apartments at #1 and 3 so is not a through road. Interesting. You have uncovered an anomaly. Perhaps our readers have an idea? Clearly, Wilby was there before Hickory Tree was built and made to join into it, at which point map makers became confused as to which was which and where. In the absence of anything definitive, I think people just guessed. I’ve been transcribing the Weston part of the 1917 Toronto city directory and finally got to a point where I could collate the streets and see what had changed. 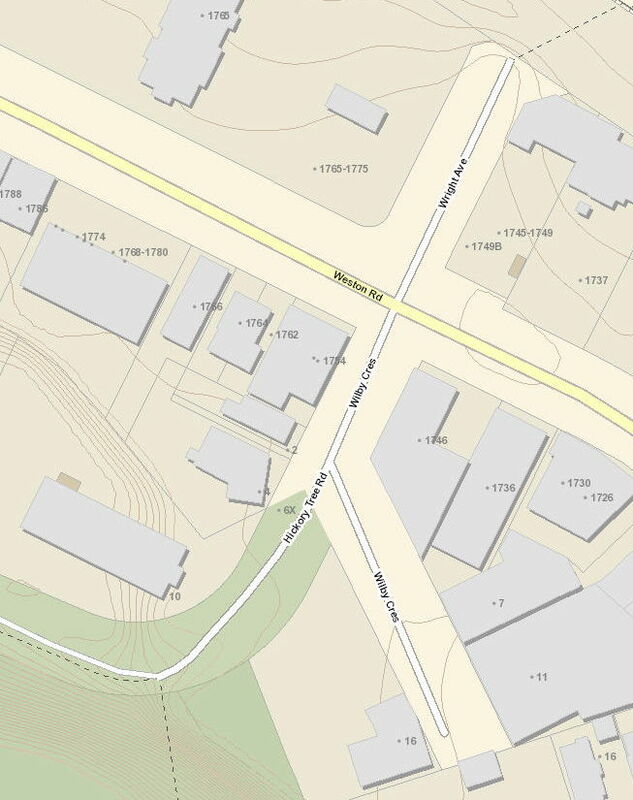 I had a heck of a time trying to figure out where Myers avenue might have been but I now think that it was roughly where Wilby is now, though they are not necessarily identical. Myers had ten houses on it, four on the north side and six on the south side. I wish I had an early 1900s map of Weston! I’ve just found some incredibly beautiful maps online! In 1923, Meyer Ave was what is now Victoria Ave West. And Wilby Cres (which isn’t there in a 1910 map) is there curving more or less as it does now — towards the end of Meyer. Hans, did you see these maps? Thank you, Roy. I will add these to my collection. Previous Previous post: New rec centre delayed. Again.